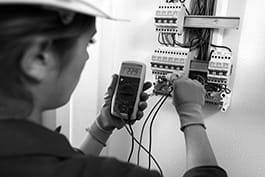 Electrical mechanics or fitters install, maintain, test, repair and adjust mechanical and electrical appliances, wiring, equipment, fixtures, etc. Assemble and install electrical wiring, equipment, appliances, apparatus, fixtures, etc., using hand tools and power tools. Perform scheduled preventative maintenance tasks, such as checking, cleaning and repairing equipment, to detect and prevent problems. Diagnose faulty systems, apparatus, components, etc., using test and measuring equipment and hand tools to locate the cause of problems. Repair and adjust equipment, machines, defective components, etc. Inspect electrical systems, equipment and components to identify hazards, defects and the need for adjustment or repair, and to ensure compliance with codes. Test electrical systems and continuity of circuits in electrical wiring, equipment, fixtures, etc., using testing devices such as ohmmeters, voltmeters and oscilloscopes, to ensure compatibility and safety of system. Plan layout and installation of electrical wiring, equipment, fixtures, etc., based on job specifications and local codes. Prepare sketches or follow blueprints to determine the location of wiring and equipment and to ensure conformity to building and safety codes. Inform and advise relevant persons (e.g. management) on whether continued operation of equipment could be hazardous.